Sun Salutations take on a whole new meaning when they are performed during lunchtime, in a city park, on a glorious sunny day, and with 15 co-workers. So what prompted Pillar To Post’s Toronto office to stretch themselves into yoga poses in the park? 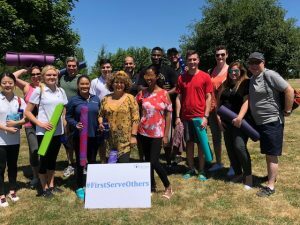 The company’s recently created Social Purpose Committee was looking for ways the team could do more to support projects in the community. 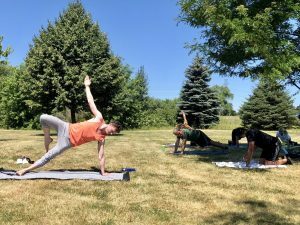 Knowing ops team member Parker Ritchie was a yoga guru, Maritza De Davila, from accounting, coaxed him into teaching the team some basic yoga poses as part of a fundraiser for the Toronto Furniture Bank. As a home inspection company, Pillar To Post helps people move into their new homes. The Toronto Furniture Bank is a charity and social enterprise that also helps people move into new homes. The organization collects gently used furniture from the community and provides it to families transitioning out of homelessness or displacement, helping them get a fresh start on their future. When word got out that Pillar To Post was hosting this unique event, colleagues from FirstService Corporation were eager to join. Collectively, the team raised $625, which allowed the Furniture Bank to furnish more than two full family homes. A donation of just $250 is enough to help furnish a home for a needy person or family. Rumor has it CEO Dan Steward has fallen head over heels for yoga – we can’t wait to see his lotus pose at the company’s next yoga fundraiser!